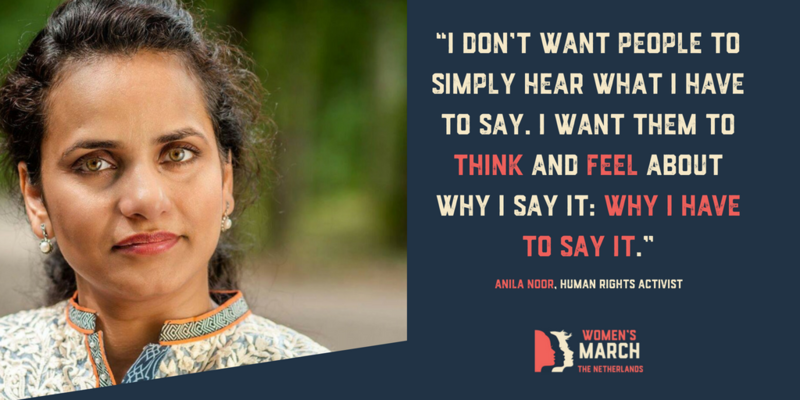 Anila Noor is a fighter. She’s a feminist. She’s an activist, a campaigner, a policy maker, a newcomer, and a migrant. She’s a mother, a friend, and a partner. She’s also the fourth daughter in a family of girls. Her parents had hoped for a boy. When Anila was born her relatives actually cried — and not from joy. After coming to the Netherlands to complete a masters study, Noor found herself immersed in the experience of forced migration and the challenge of straddling multiple cultures. Her studies focused on forced migration, asylum, refugee policies and advocacy for the rights of migrants. Noor is now working on the subject of receiving refugees in urban settings, particularly here in the Netherlands. In Pakistan, Noor worked with minority communities and with women who had suffered violence. Noor formed the New Women’s Impact Hub as a way to reach migrant women and help them discover what they can do. “It’s not a stichting [non-profit organization] or business, it’s a movement,” she states. Many migrant women arrive in the Netherlands with the hope of entering a more open society, only to find themselves facing familiar patterns of patriarchy and control. The needs of migrant women are often ignored. The men tend to interact more with the Dutch authorities. Often, women find themselves isolated and dependent on their husbands. Recently, Noor was appointed to the European Migrant Advisory Board, which focuses on the Inclusion of Migrants and Refugees. She plans to continue her advocacy to bring more attention to the needs of migrant women. In March, she’ll be all over, from the floor of the EU Parliament in Brussels to Studio/K in Amsterdam on March 11th for the International Women’s Day Festival. And we’ll be listening to what she has to say. This piece was originally published on womensmarch.nl. The site no longer exists, so I republished it here.